So you are ready to take some oboe lessons. You've just moved to the area, or you've gone through a year of band and your parents have decided that you seem committed enough to begin to be serious, or you feel that your own private practice has stalled and you need new insights. What does it mean, when a teacher suggests that you come in for a trial lesson? The trial lesson is usually not a free lesson - you are still occupying the teacher's time and energy with your presence. It is, however, a low stakes, low commitment way to see if you and your teacher are going to be a good fit for each other. Of course you should use this opportunity to learn as much as possible. Even if you've been taking lessons for years, a different perspective will inevitably offer some new insight into your oboe study. If your teacher says something brand new, that lesson was 100% worthwhile. If the teacher only says exactly the same things as your previous instructors, that should be a major red flag for YOU. Perhaps this THING is a real problem that you actually should work on. If the teacher contradicts something else you've been told, this is a golden opportunity. You could silently take the advice away with you and then experiment to find your own truth, or you could ask the teacher to explain the contradiction - either way you learn and you get new ideas. Not bad for a single lesson! As you are going through your trial lesson, notice the way the teacher interacts with you. Does she play her instrument with you? Does he demonstrate proper technique? Does he engage with the problems you seem to be having? React to you as a person? Everyone has their own style, and you want to make sure that you are comfortable with the person who will be working with you one on one every single week. Some teachers are nurturing, some are taskmasters, some are easily distracted, some are more interested in equipment than technique and some go to the other extreme. The lesson you are getting - is it helping? This is your chance to feel out what the relationship will be like, and if you don't sense that you are getting good value, or enjoying the process, or at least heading in a good direction, you can thank the teacher and pay her and never come back. Please understand though, that trials go both ways. A teacher isn't going to bring you into her studio if she doesn't enjoy working with you. A teacher might choose not to take a student whose playing is not at a high enough level. There can be personality differences, or style issues. And this is your time to show that you can learn, and you can change what you are doing, and you are an interested, engaged party to the work at hand. Be open to new ideas, be willing to try, and be yourself. Let the teacher get to know you so she can like you right away. You may not realize this, but you are on trial as a client as well as an oboist. 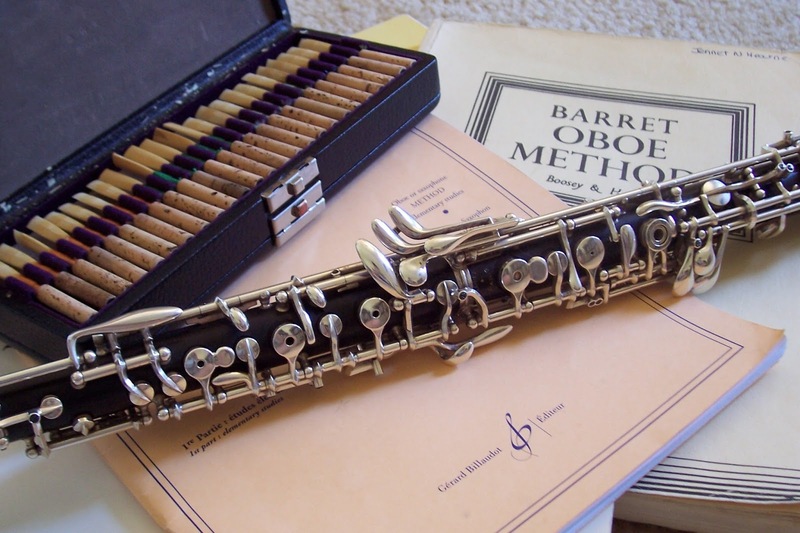 Teaching is a job, and running a full studio is a business, and bad clients can make your teacher's life hard just as quickly as bad oboists can. If you cancel your trial lesson, or reschedule it more than once, that's a bad sign. If you accidentally leave your oboe, reeds, and music locked up at school and come to your trial lesson empty handed, that's a bad sign. If you ignore a rescheduling email from the teacher and come at the wrong time and then blow off the correct one, and don't get in touch to apologize or clarify, that's a super bad sign. Things come up, in life, and all of these sorts of misunderstandings can happen - but if they happen early on, in your trial lesson, that's a red flag to the teacher. First impressions are important, and the teacher is trying to decide whether you'll be an asset to her class, and you may not be. Many times with younger students this is a parent issue, more than a student one - if you are applying for lessons for your child who needs to be driven and scheduled and paid for by you, you are ALSO on trial at the trial lesson! All this to say - a trial lesson with a new teacher is a great opportunity. It's not a bad idea to take one with every oboist in your town - you get to hear lots of different ideas, and can make an informed choice about who you want to work with. But please know that a trial lesson is effectively an audition for BOTH parties. Have a great Back To School, Everyone! I'm still playing outdoor concerts, but it's suddenly the beginning of the teaching year! Here's a post about starting out right - please share your own embouchure teaching ideas so we can ALL set out on a good foot! I had a new student start with me last week. This was a young boy, who had had a year of band but no private lessons on the oboe. I spent the first 10 minutes of the lesson getting his equipment to work for him, and the next 15 making him sound like a million bucks, just by setting him up with a good embouchure. The oboe embouchure is not the most intuitive mouth shape to use. If you weren't told, you might never think to turn your lips inward in order to blow outward. You might not naturally come up with the balance of tension and openness that translates to a projecting, controlled, nuanced sound. It's not an obvious approach, and this particular 11-year-old wasn't even close. My favorite thing about teaching is how different all of my students are from each other. Many of the problems are common, but different people need different words to understand new concepts. I've developed a lot of different versions of schtick to talk about embouchure to students. Some work better with one and some relate to another. It took me a few minutes of rapid fire options to connect with my new student. Tuck your lips inside your mouth. Now your mouth is too flat - think about being round. Bring the corners of your mouth in. Be a little owl, crying "Hooo! Hoooo!" Now bring your lips inside. Be a French person, with your face balanced forward. Now drop your chin and pull it back into your neck, like Prince Charles. Pretend you are at McDonalds, drinking a milkshake. First you have to seal your lips around the straw, so no air leaks out. BUT, if you clamp the straw tight shut with your mouth, there's no room for the milkshake to come through, right? So you have to keep the straw round and also sealed. Also, pretend you are sharing with your best friend and you don't want to get spit on the straw, so roll your lips in so the dry part of your lips is on the straw... Do you see where this metaphor is headed? Imagine a cute puppy. Say it with me - CUUUUUTE. Now, as you're saying that, the puppy is leaping onto your lap and licking your face. Tuck your lips in so he can't lick inside your mouth. Because dogs are gross. And that was it. THAT'S IT! Put that on the reed. Do you hear how great that sounds? Play me a Bb. Play me a scale. Reset, with your lips inside (so the puppy doesn't get them), and play it again. YAY! I love young students. I love teaching. Who's got more mouth imagery to share?